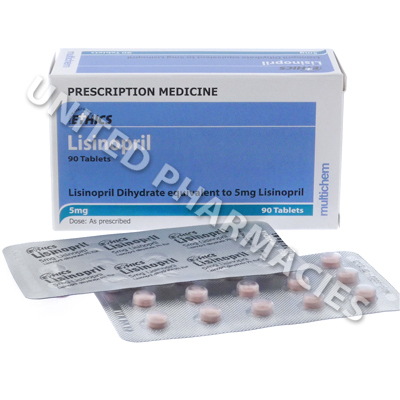 Ethics Lisinopril (Lisinopril) is indicated for hypertension, heart failure and diabetic nephropathy. It works by relaxing the blood vessels and preventing them from constricting. The mechanism of action is derived from its ability to inhibit the ACE (angiotensin converting enzyme), so as to prevent the tightening and narrowing of the blood vessels. ACE is a type of substance called a peptidyl dipeptidase, and by blocking it, this medicine prevents the synthesis of angiotensin II (a substance with vasoconstrictive properties). This in turn has a widening effect on the blood vessels and helps to ameliorate high blood pressure. When used for diabetic nephropathy, it may improve the renal function. It has been theorized by experts that this may be due to its effects on the renin angiotensin system. Ethics Lisinopril (Lisinopril) is available as 5mg strength tablets and is generally administered once per day. The exact amount that needs to be taken, as well as the strength of tablet required will differ according to each situation, and patients must listen carefully to the instructions handed out by their physician. Other medical disorders may be treated with a different dosage and in all cases it will be necessary to strictly comply with the instructions given by the physician. The list provided above is not complete and other reactions are also possible. Consult your physician straight away if you suffer from sudden swelling and increased body weight, signs of fever, aching of the body, muscular problems, a noticeable drop in the amount of urine excreted or any other severe adverse events which are not referenced here. There are some important points to take into account when taking this medication. It is essential that pregnant women do not take this drug, as it may cause serious harm to an unborn baby. Some patients, and in particular those who are taking this medicine together with other drugs, may need to have regular blood tests conducted. If this applies to you, it is essential that you attend all scheduled medical appointments. Always use Ethics Lisinopril (Lisinopril) as you have been prescribed by your doctor. Never self-medicate or change your dosage without first consulting your doctor. The correct dosage can vary depending on your health, medical history, and the severity of the condition being treated.